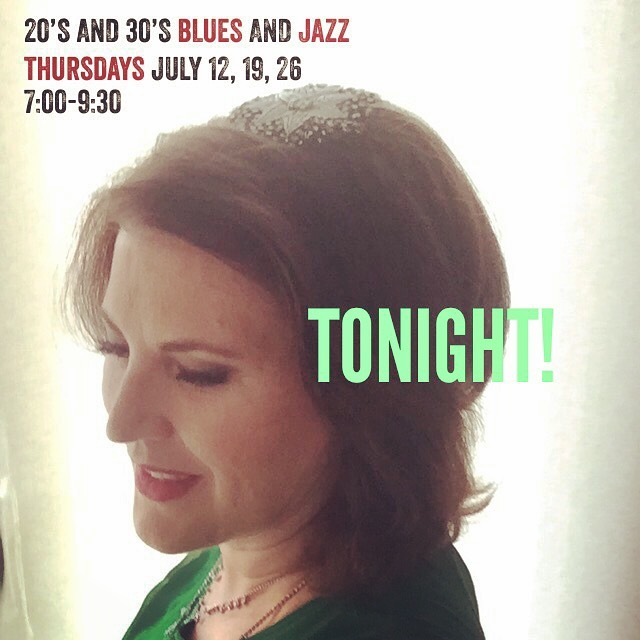 Jazz vocalist Juliet Varnedoe sings original arrangements of jazz and blues from the 1920's and 30's. Her cool lush vocal style is backed by her swinging quintet. Her stage presence evokes the glamorous heyday of the Jazz Age, with influences of Peggy Lee, Julie London, and Anita O'Day. Born in Germany and raised in Louisiana and Florida, Juliet was nurtured on the soulful sounds of the 20’s and 30’s hit parade in her family’s home. Her approach to her material draws from a repertoire of standards influenced by her Louisiana roots and her classical piano training. She graduated from the San Francisco Art Institute and became a sought after freelance fashion and event photographer for over fifteen years, but her musical muse kept calling. When she moved to New York she honed her performing skills at open mic jazz clubs such as Smalls and the Metropolitan Room, eventually venturing out with her own shows at Don't Tell Mama and The Duplex. In 2016 she sought out a musical partner to form a jazz band and met pianist and arranger Nich Mueller. This partnership formed the band and led to a residency at the Manhattan Inn and the Montauk Club, where they established their swinging "little big band" sound. Juliet has garnered her passion of swing music and the glamour of the jazz age fashion to bring new life and unique interpretation to American classics. My parents met singing in the St. Louis Cathedral choir in New Orleans. I was born in Germany where my father took a teaching sabbatical. I flew back, an infant in cardboard box, to New Orleans, where I spent my early childhood. My mother played songs from the Great American Songbook to entertain her children on thundery afternoons. I sang along to those gems on the purple green carpet by the piano. We moved to the lightening capital of north America when my father transferred to a new university. Because of the Cuban Missile crisis, Tampa was a fairly desolate place, but it didn’t stop my parents from building a ranch house on a sandy dirt road. My father carried a leather satchel with white chalk in the pocket and rode his bicycle to teach. I studied piano with the French professor’s wife, a petit Francophile who played Chopin poetically. I would listen to her play before I knocked on the door for my lesson. I wanted to enter that world and stay there forever. I became a devotee of German masters: Bach, Mozart, Beethoven – I felt it was my duty. In grade school, I sang in the church folk group; we had a guitar, piano, drums, and even flute. I wore a mini skirt and felt liberated. This group was disassembled because the new chorus director insisted on playing the organ and singing straight from the hymnal. It made me mad. He had yellow teeth and a scratchy voice. When he played, nobody sang along - it was like trying to tie a knot with a rough splintery rope. My young appeals meant nothing, so I gave up singing in church, but I was still devoted to the masters. I accompanied the choir with piano, and sang supporting roles in the high school musicals – a bird, a rejected lover, a middle daughter. Musically, my education was uneven. I decided to study piano at the local university with a professor who gave high strung lessons about romantics. With a satchel full of music scores, I was the one riding the bike. I accompanied singers, cello players, and small ensembles. On the bike path, I realized that I missed the purple green carpet tunes from New Orleans, and I gave up playing in university recital halls that smelled like air conditioning and chalk. Instead, I read literature under oak trees on the humid Florida lawns. I had the grand, but unoriginal idea, of crossing America to find a bold, new dream. I drove through deserts and mountains in a white Ford sedan and ended up at the edge of the continent. I felt liberated. I figured San Francisco was far enough away from everything I knew so I could make all the mistakes I wanted without anyone interfering. I got into art school and spent time finding some clarity in the foggy bay light. I started a photography business in my large Victorian flat and made large B&W prints. I liked being in the dark room with the red light; it reminded me of practicing. There was a fancy jazz club that opened up right down stairs. I heard swinging jazz tunes coming through the kitchen floor. It was a dream. I’d take pictures in the day, go downstairs at night, and listen to the players playing their hearts out . . . shook me up. Romance was in the air. I married the club owner, but we weren’t ones for settling. We wanted a new dream, so we drove through mountains and deserts in a Black Jeep to the other edge of the continent. The stages of New York beckoned with a persistent siren call. I had to listen; it was interfering with my psyche. I took up cabaret and sought out small dark rooms with red lights. I wanted to shake that scared feeling and get some guts for the lime light. I did and wanted more. I kept hearing the songs from the purple green carpet. No more German masters. I wanted to knock on the door of the Americans – Ellington, Porter, Kern. After all that searching for hidden gems across the land and I came back to the origin. Now I live in Brooklyn, playing 20’s and 30’s tunes with my jazz band. The Juliet Varnedoe Sextet played a six run series residency at the historic Montauk Club in Park Slope Brooklyn. Built in 1894, this beautiful setting was the prefect environment for swing dancers to come dance on a traditional wooden ballroom floor. This series further established the style and sound of her band.